Delco, a Florida brand. Donated by Walt Wimer. became a DELCO, but it was flying that brand on a 1984 trip back to the Sunshine State. SING/TENNECO on Fla. 44 west. 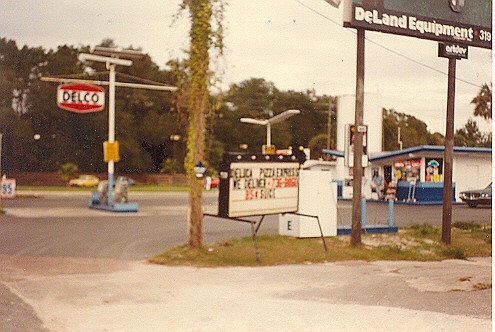 The third was a former HIGHWAY OIL site on Fla. 44 east. I am pretty sure FINA is now gone from of Florida, so wonder what these stations are today?? Maybe the company went back to their own DELCO brand or branded up with another supplier?? informing me that they are alive and well, still based in Deland, Florida. They market under Delco and several major brands.